In some remote corner of Switzerland, up in the mentally-invigorating air of the Alps, there must be a colony of the ancestors of Rube Goldberg, who have spent their lives for generations back in the design of trick time-pieces and clockwork birds in gilded cages. For centuries, these ingenious and involved mechanical devices made into objects of art have been the appropriate gifts for emperors and their ladies, and many a museum has examples of golden singing canaries in jewelled cages who trill off the hours to the accompaniment of tinkling tunes, or little animated blacksmiths who strike the hours on silver gongs. Some of them have little parading figures and other ingenious whimsies in the Louie-the-Quince style. They still make and sell these things—every expensive jewelry-shop on Fifth Avenue has one in the window. The original of the one pictured Figures 49 and 50, sells for $150, yet there is no reason whatever why a good craftsman cannot make one every bit as striking and beautiful, depending on the brilliance and color of the new cast resin plastics as a substitute for the gold and jewels in the original. To my mind even more striking—and certainly more appropriate—effects can be obtained, with plastics. Jade, carnelian, ruby, onyx, emerald and rose quartz are only a few of the remarkable effects obtainable in this material at a trifling cost. Most important is the fact that the material can be worked with any type of woodworking or metal working tools and machines. In working out this design, the detail dimensions depend entirely on the sizes of the two principal component parts—the clock-works and the little globe. Globes of about 4-inches diameter are obtainable nowadays either in the flower-shops, where they are sold for holding little hanging vines in the house, or in the fish stores, where they are used for housing a pair of diminutive guppies until they become family-minded. In a pinch, a discarded 100-watt light bulb could be used, or even the bottom of a chemistry decanter might be used. The only requirement is good clean glass and an opening of the proper size. Fig.49. The fish-globe dock. Project 36. 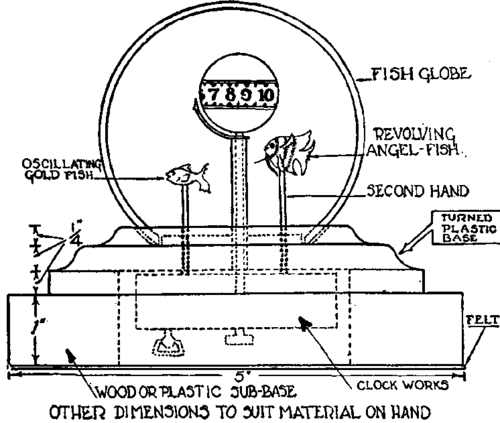 Any type of clockwork can be used except the AC electric, provided the stems are accessible for attaching the uprights carrying the fish and the time-ball. Beginning at the bottom, the sub-base can be turned of wood, to save expense, and to make room to house the winding-stem, etc., of the clockworks. The one pictured was made of one-inch mahogany, square, and stained dark. (Figure 50). 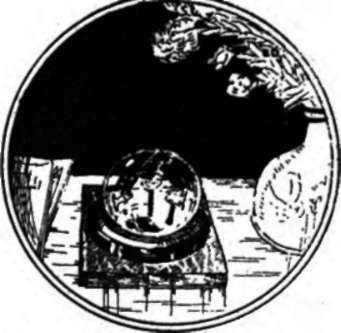 A ten-cent -fish-bowl, or round Ivy-globe forms the cover. If you have two sheets of quarter-inch plastics, in contrasting colors, on hand, you can build up a 24-inch thickness for the upper part of the base inexpensively, without having to buy a solid block of standard size. The three sheets are cemented together with the proper plastic cement, and the whole then turned and polished on a face-plate in the lathe, making recesses of the proper size to accommodate the clockworks and the globe. The time-ball is turned from plastics rod, 3/4-inch or 1-inch, whatever is on hand, preferably in a light color, and a flat band is turned around the circumference, with a light groove on both sides of the band. The hour-numbers are then scratched in with a sharp-pointed tool, as well as little scratches or dots for the quarter-hours, and then wiped over with black quick-drying lacquer to "inlay" them and make them visible. A hole is then drilled in the bottom of this ball and a brass tube inserted, the bottom end of which fits over the hour-stem of the watch, to make a complete turn in twelve hours. Make another brass tube, either out of flat, rolled and soldered, or out of tubing, large enough to surround this tube freely, and a little pointer which is soldered to the top of this tube, pointing to the hours. The bottom of this tube is fastened rigidly at the base, so that as the ball turns, the hand stands still and points to the hour. This outer tube can also be made, if desired, out of plastics, by drilling a hole thru the center of a rod of the proper size. The next step is the oscillating gold-fish. He is carved out of a small piece of plastics of an appropriate color and mounted on the end of a small rod, wire or tube which is in turn attached to the spindle of the oscillating pawl. This is a rather delicate job, although with a bit of luck you can do it. If you hestitate to tackle it however, the corner jeweler will probably do it for you for fifty cents or so, as well as the job of attaching a similar stem to the spindle of the second-hand, to the top of which is attached the carved Scalare, or Angel-fish. This particular fish swims slowly and dignifiedly about, and the rotation of the second-hand is just about his speed, so that he will look natural enough. The lines of fins, gills, eyes, etc., on both fish can be etched in and outlined with black. Before determining your final dimensions of all these in-the-globe parts, make sure that when assembled they will pass thru the mouth of the globe.